Rio de Janeiro Airport (GIG) or its full name Antonio Carlos Jobim International Airport is the main airport of Rio and the second largest airport in Brazil. In colloquial terms, the airport is known as Galeao International Airport and with a change of airport operator in 2014, the new brand name is RIOgaleao - Aeroporto Internacional Tom Jobim. The two largest local airlines are TAM and GOL, both of which have a base in Rio and offer international connections, for example to Miami and Paris, in addition to numerous regional destinations such as Brasília and Belo Horizonte. Terminal 1: Azul Linhas Aéreas, Flyways and Gol. Terminal 2: Aerolineas Argentinas, Air Canada, Alitalia, American Airlines, Avianca, Condor, Copa Airlines, Delta Airlines, Delta Airlines, Edelweiss, Emirates Airlines, Iberia, KLM, TAM, TAM, Lufthansa, Passaredo, Royal Air Maroc, TAAG, TAP Portugal, United Airlines. Most of the air traffic will be handled in the new Terminal 2, so it is the busier one. However, both terminals have the usual infrastructure and service facilities that meet the standards of a major international airport. The airport is located 20km from the city centre of Rio de Janeiro. Numerous buses, taxis and train connections are available to reach the airport from downtown. There are luxurious (blue) and ordinary (yellow) taxis at your disposal, which can be booked at the company stands in the arrivals halls of both terminals. The TransCarioca line of the Rio Bus Rapid Transit (BRT) public transport system connects terminals 1 and 2 with the bus station Alvorada in Barra da Tijuca with a stop at the subway line 2, Vicente de Carvalho station, where you can change to the entire subway system. At Alvorada you can switch between the TransCarioca and TransOeste lines. The public transport in Rio runs 24 hours a day and tickets are sold at the BRT counters on the arrivals level. Bus 2918 follows a similar schedule to the Alvorada Bus Terminal, but with a different and shorter route via the expressway. Bus 2101 is an express connection between Galeao and Santos Dumont airports. Bus 2145 is a regular city bus service to the central bus station, downtown and Santos Dumont Airport. It runs every 20 minutes between 5:30 and 22:30. Ticket counters for these bus lines are located in the arrivals area of both terminals. Viaçao 1001 operates the city bus line 761-D from the airport to Niterói. The same company also operates a premium bus to Armaçao dos Búzios four times a day. Departure is from the arrivals level of Terminal 1. Buses 924 and 925 go to the district of Ilha do Governador and 915 to Bonsucesso. From both districts there are connections to the north and south side of the city. 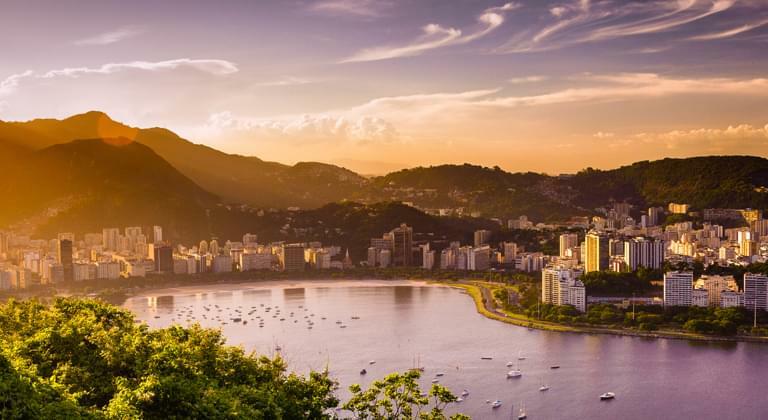 Due to its size and sheer number of attractions, there is only a small selection that most people know as the city's landmark and should not miss on any Rio visit. The cable car takes you to the top of the Sugar Loaf Mountain, where you can admire the Guanabara Bay, the promenade of Rio de Janeiro and places of interest such as Pedra da Gávea, the hill of Dois Irmaos and Corcovado. Address: Avenida Pasteur, 520, Urca. The Christ Redeemer statue, the city's most famous symbol - and most of the time voted as one of the seven wonders of the world - is at an altitude of 710 m above sea level. There are two ascents to the monument: minibus or train. The 20-minute train takes you on the Corcovado Railway, which was inaugurated in 1884 by Dom Pedro II, Brazil's last emperor, and crosses an Atlantic jungle. Address: Rua Cosme Velho, 513, Cosme Velho. Considered by many football fans as the "temple of the gods", is one of the largest stadiums in the world. It was built in 1950 to house the World Cup and designed to accommodate 166,369 people. Today, after some renovations, it covers a capacity of 87,630th access is from the Rua Professor Eurico Rabelo, gate 16.